A new faction within the EFF feels that Julius Malema and those around him are undermining the party’s constitution and should be removed from office. 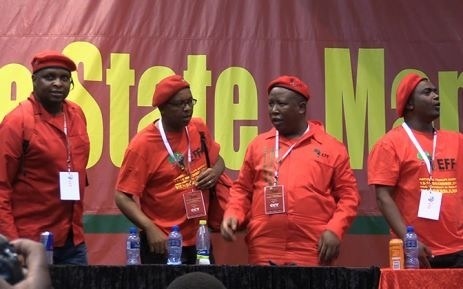 A group of members that claim to belong to the newest party, the Economic Freedom Fighters (EFF), has indicated that it is willing to go as far as removing its leader physically from power if needs be in order to protect the integrity of the party’s constitution. The group was speaking on Monday during its launch in Johannesburg. Speaking to the media against the background of its launch at a venue in the metropolitan city of Johannesburg, the group’s leader, Lufuno Gogoro said that all the members of his group were in agreement that the party’s leader and those around him were undermining the party’s constitution and they had consequently vowed that they would protect it from people such as Malema. He said in their discussions, they had come to the conclusion that Malema and those around him were bringing harm to the party’s constitution by becoming the dictators that they had now become. Gogoro went on to say that they were willing to go to the party’s head office to ask him to vacate the party position that he now held, adding that if he was not willing to do so, they would physically remove Malema and his cronies and lock the building. There have been several voices of dissent within the newest party on the South African political scene, the Economic Freedom Fighters, mostly directed at the party’s elected president, Julius Malema and his lieutenants like Floyd Shivambu and Ndlozi and others with additional accusations of being inaccessible to the masses. One area of concern has been the mushroom of land grabs across the Gauteng province. While the party has publicly supported the land invasions, there have been undertones of disapproval from the leadership, which does not seem to be pleasing to the likes of Gogoro. Recently, the party went on the rampage in Soweto’s Mzimhlophe area, where more than one hundred houses were forcibly occupied. One of the leaders of the EFF in the area, Arafat Tladi said that his party was now more than ever determined to implement land grabs across the province. He called on the Johannesburg Housing Development to register the forceful occupants as the new owners of the houses.